I started covering mobile games at SuperPhillip Central in February after a long time coming, and since then, I've been quite busy preparing new mobile games for review. The market is absolutely saturated, so it's hard to get an idea of the good, polished games from the rubbish. 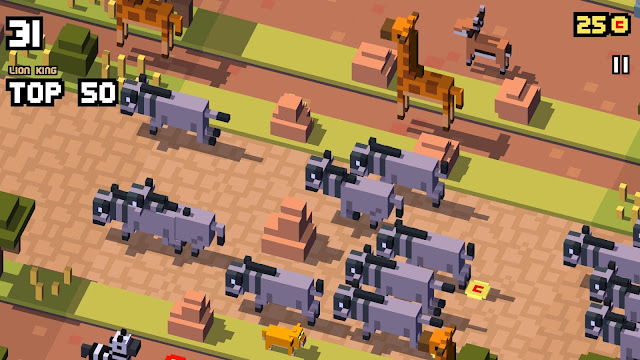 Disney Crossy Road is one of the good, polished games. Certainly not rubbish, as you'll be able to tell with my review. Why did the mouse cross the road? To get a high score! I'm not a huge Disney aficionado, but I can't lie and say that Disney doesn't have some place in my heart, as corny and dramatic as that sounds. I love a good animated yarn, whether it's Hercules, Aladdin, or my personal favorite, The Hunchback of Notre Dame. Of course, Disney Crossy Road doesn't have any of those franchises in them, but the game is ever-expanding anyway, so maybe some day. Even still, the movies that it does contain are wide and varied, offering a robust roster of characters for each in wonderful voxel form. Upon reading the title of this game (and assuming you know what Crossy Road in general is), you should know what to expect from it. You move diagonally through multiple lanes of traffic, hoping to avoid getting squashed or run over by an obstacle as one of many Disney characters in various Disney environments. 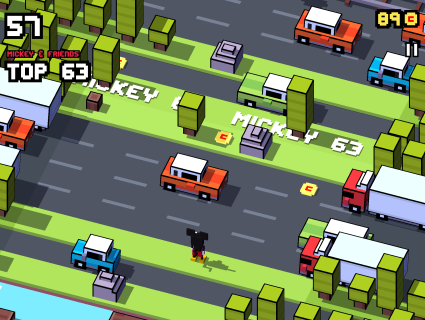 It's simply Crossy Road with a Disney flavor, right? Well, yes and no. The addictive quality of Disney Crossy Road comes from acquiring new characters with the Gacha machine, giving you one turn at it for every 100 coins you collect. This is done by waiting a specific amount of time until you're rewarded money and collecting coins strewn about the game's levels. With any Gacha machine, some characters are easier to get than others. Because why should that blasted chicken get all the fun? When you unlock a new character, you're not just getting a new figure to look at and admire. Depending on which series that character you earn is from, whether it be Mickey Mouse, Toy Story, Tangled, The Haunted Mansion, or Inside Out, to name a handful, the course you play is different. The Haunted Mansion houses dark corridors that need you to touch lights in order to brighten up the room, enabling you to get a better view of upcoming obstacles. Meanwhile, Tangled has a forest setting with rolling barrels that hurdle towards the player that much be evaded. Having different levels types based on the series your character is from makes you want to collect as many characters as possible from as many series as possible. It makes something already addicting even more so. A racetrack so sweet that it'll give you cavities. 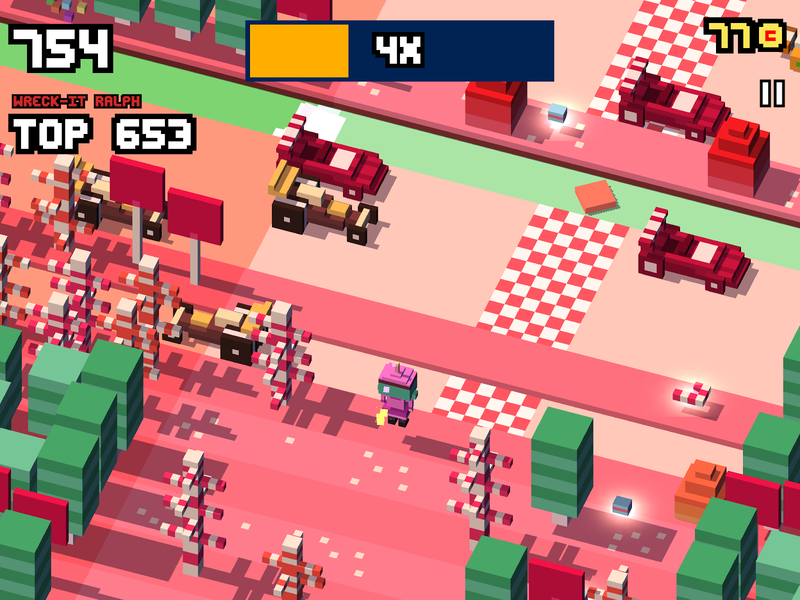 Those who know Crossy Road's gameplay will feel right at home, and those who don't will still find themselves welcomed thanks to the intuitive control system. You tap the screen to move your character forward and swipe left and right to move your character in that direction. It's a simple, easy, and accessible control method that most anyone can use. There are two main goals in Disney Crossy Road, and they are to gain a high score-- each movie has a different personal best high score to keep improving on (or at least try to keep improving on)-- and to amass a collection of characters. The former's longevity comes from how much you enjoy setting high scores or not, while the latter is much more engaging, making you want to keep playing to build up your coin amount and character collection. Egad! A stampede! Find your bearings and cross when it's safe, or SPLAT! While Disney Crossy Road is free it does offer some in-app purchases to unlock characters more quickly. For instance, buying Hamm from Toy Story for $4.99 (USD) gives any character you play as a faster accumulation of coins. Additionally and occasionally the game will show a character you can purchase with real world money in-between plays. Disney Crossy Road is fantastic for its free price, and can easily be played without investing a dime. However, if you want to unlock characters at a swifter speed and pace, then you have that option. Otherwise, beating your personal best high scores for each movies' obstacle course and building up your character collection are things that will keep you coming back for more. Two new site update announcements!